A head trip indeed. 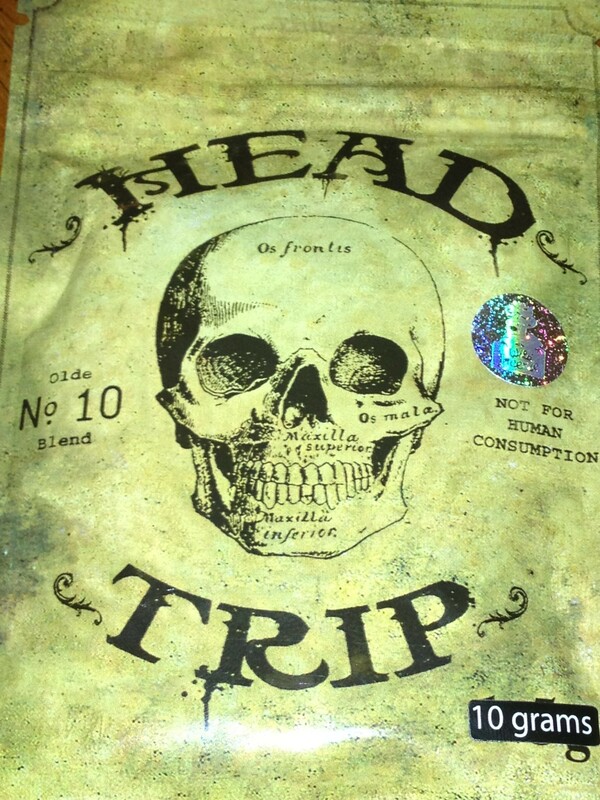 I have seen Head Trip pop up just about everywhere but could never find consistent enough reviews to build up the desire necessary to pursue attaining a bag. With a product that gains such high popularity it is necessary to take individual reviews with a grain of salt (even this one if you like) as some competition loves to bury anyone they see as a threat. It finally came time for me to give it a whirl myself to satisfy my curiosity. After burning didn’t require much convincing for me to realize that this is good incense, very good indeed. I can’t honestly say that it’s the most potent – there are stronger out there. But for a retail product available almost everywhere, it’s as good as one would hope. The cover is beyond the boundaries of badass, perhaps a subconscious contributor to its broadened popularity and appeal amongst consumers. The first thing a customer sees at a store is the product’s packaging. First impressions are strong. Even though one must remember not to judge a book by its cover, this particular cover is undeniably enticing, and what’s inside that book doesn’t disappoint. The smell is very pungent, and the scent carries well through the burn (though perhaps a little too much after a while). It is appropriately named and while burning, it grants a pleasant sensation in the noggin and a mild uplifting body sensation which will last approximately 30 minutes.